We are so happy to introduce our signature candle with Alchemie’s custom scent! To make this dream come true we have partnered with Prosperity Candle. It was an easy choice to make when we read what their mission was. Their company was founded in 2009 as, “ a social enterprise that supports refugees and artisans through candle-making and beautifully crafted vessels easily refilled or repurposed for a lifetime of enjoyment. As we like to say, there’s a story behind every candle we pour.” Prosperity Candle is a certified B-Corp for Community and Environmental Stability–Heck yes! We couldn’t be happier to support a business who engages with their community and is environmentally conscious–that’s kinda our thing too! 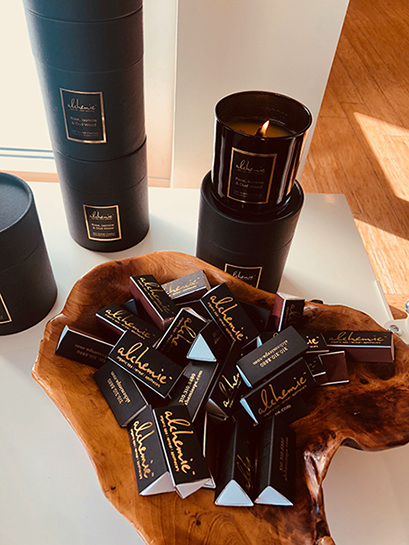 We are so thrilled to announce to our boutique Alchemie signature candle, Sacred Rose, that has been designed to capture the ambiance of our tranquil retreat on the beach-side. Our Soy candle is infused with Rose, Jasmine, and Oud wood to fill your home with that intoxicating aroma you will love! It’ll be like taking a little bit of Alchemie Spa home for your pleasure. Shop for it at Alchemie Spa!